The operator failed to act on a critical warning about a defect in the axle, said a senior counsel with the state Attorney General’s Office. Neither the Aurora Bridge — nor the state — were at fault for the broken axle that sent a Ride the Ducks amphibious vehicle careening across the center line and into a charter bus full of international students, said a lawyer with the state Attorney General’s Office. The blame lies with the Missouri-based company that made the World War II-era vehicle and its operator, Ride the Ducks Seattle, which failed to act on a critical warning about a defect in the axle, said Steve Puz, senior counsel with the Attorney General’s Office. 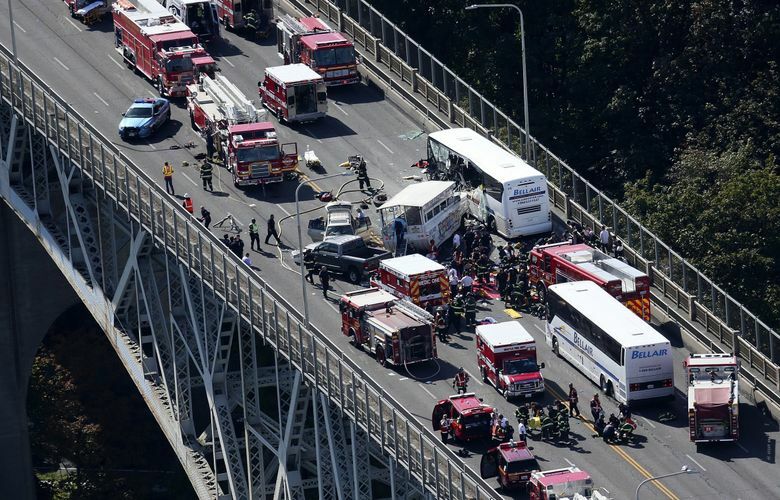 On the witness stand, Delbert Lance Bullard Jr., a civil engineer with the Texas A&M Transportation Institute, said that “while there is always a risk when traveling on the road,” wider lanes on the Aurora Bridge would not have prevented the Ducks crash. He also said that, based on data presented to him about the Aurora Bridge’s serious and fatal collisions between 2002 and 2015 — before the Ducks crash — that there was a less than 1 percent chance of a serious or fatal collision on that stretch of Highway 99. Bullard was retained as a traffic-safety expert for the trial by both Seattle and the state of Washington. Both defendants had reserved the right to give their opening statements in the civil trial, which began in October, until the plaintiffs had rested their case. Likewise on Monday, the city of Seattle denied culpability in the crash. Though the state and city have denied responsibility for the crash, both last year settled with the families of 12 victims. In November, Ride the Ducks International and Ride the Ducks Seattle settled the lawsuit for $8.25 million with four of the plaintiffs, including the family of one passenger who was killed. The 2016 lawsuit claims that Ride the Ducks Seattle, a locally owned Ducks licensee, and Ride the Ducks International, as well as the city and state, all bear some responsibility for the fatal crash. The suit also alleges that Ride the Ducks International, which refurbished the Duck vehicle that crashed, had issued a service bulletin to the Seattle operator recommending the axle be repaired on the vehicle. The local excursion firm did not make the recommended axle fix, investigators determined. Ride the Ducks Seattle, a licensee of the Missouri-based Ride the Ducks International, failed to heed the 2013 service bulletin that advised owners of the vehicles to add a metal collar around a potential weak point in the axles where fractures had been found, plaintiffs allege in the suit. The Seattle company admitted to the 159 critical safety violations and 304 record-keeping violations two years ago and agreed to pay $222,000 in penalties to settle the state complaint. The manufacturer of the amphibious vehicle agreed to pay up to $1 million in civil fines in connection with the Seattle crash for violating federal safety regulations, U.S. transportation officials said. The trial is slated to resume Wednesday.